You may be wondering if it is possible to connect your Facebook Page to multiple Twitter accounts, either as you have more than one Facebook Page or more than one Twitter account. I faced this question, when I was setting up this blog to be separate from some other Facebook pages and Twitter accounts that I manage. Now from my experience, it’s difficult to set up this from the Twitter to Facebook side. This is the following issue you’ll often face. So we’ll need to approach it from Facebook to Twitter instead – since Facebook gives you some more customizable selections here. 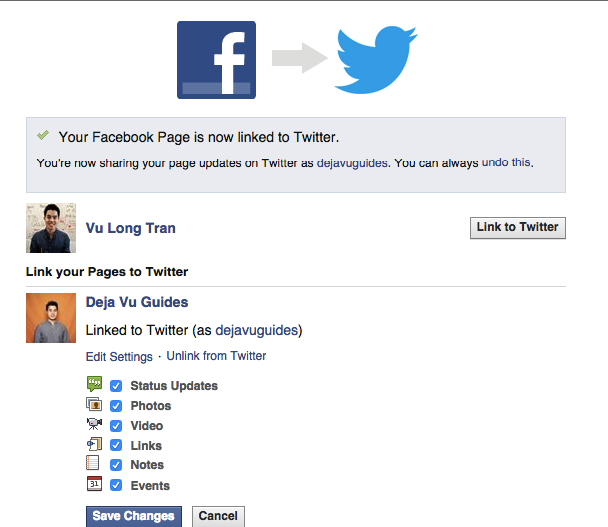 In this example, I was looking to link up my @dejavuguides Twitter to my DejaVuGuides Facebook page, but I already have my @vulongtran Twitter and VuLongTran Facebook pages connected. To resolve this issue, you need to set this up on Facebook’s side, so you are selecting the Facebook account you want to connect. It’s not easy to find where this is on Facebook’s settings, so I’d suggest visiting this page directly. Choose your personal Facebook account and then click “Link to Twitter”. Then simply choose which items you’d like to send to Twitter. I’d suggest the “Status Updates” at the minimum and maybe the “Links”. The rest, are more depending on how you what your business/ personal needs to share across from Facebook to Twitter. If you refresh the page, you should see something like this. Note – This is only to post from Facebook to Twitter only. There doesn’t seem to be a way to make it from Twitter to Facebook from the options that I have seen. There is a difference, as it’s one way from Facebook to Twitter and not the other way around. As you’ll see in this screenshot. From a practical perspective, it simply means you post more inside the Facebook website instead of Twitter. What are custom Permalinks in Blogger.com?